A huge, foreshortened iron horse steams and belches dark smoke as it leaps out of its frame and almost off the wall of Dan Sawatzky’s former home and studio. 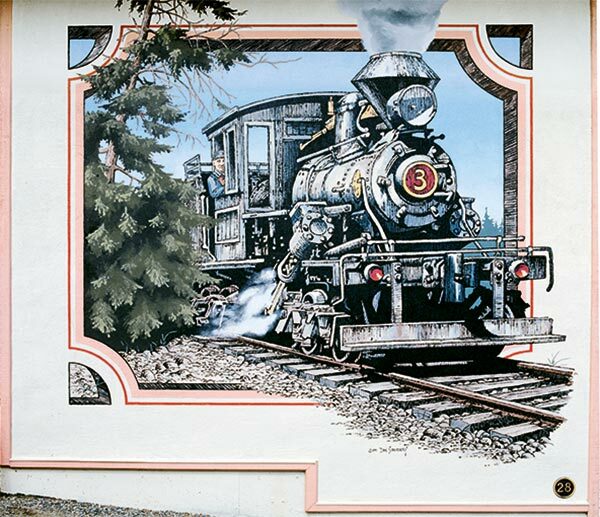 The subject, a working engine operating in the Chemainus area early in the 20th century, is of particular interest to the artist, who has always been fascinated by trains. Engineer Sam Alexander operated the No. 3 Climax Engine as it hauled logs along the rails of the Chemainus Valley. 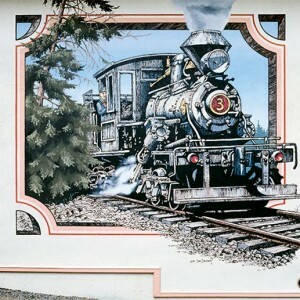 The E&N Railway was completed in 1886, although working trains had been a familiar sight in the community for several years. The larger engines plied the rails through the hills and the valleys of the E&N land belt, from which the Victoria Lumber & Manufacturing Co. Ltd. drew a great deal of its timber. Smaller, more compact engines worked nearer to and at the mill, shunting timber and finished products to where they were needed.